Happy Sunday… A few weeks back my skin broke out very badly that I was frustrated and bought everything that claimed to control acne but later after using all those products, I realized that my skin needs only 1 product and today I’m gonna review the product that helped with my acne almost instantly. It’s none other than Juicy chemistry’s Frankincense and hemp seed acne control serum. Let’s jump into the review guys. It is available at nykaa here currently on 15% off and at juicy chemistry here. Cannibis sativa(Hemp) Oil, Carthamus Tinctorius (Safflower) Seed Oil, Rosa Canina (rosehip)oil, Lavandula angustifolia (Lavender) Oil,Argania Spinosa (Argan) Kernel Oil, Boswellia carteri (Frankincense) Oil,Curcuma Longa (Turmeric)Oil, Euginia Caryophyllata (Clove) Bud Oil,Santalum Paniculatum (Sandalwood) Oil,Azadirachta indica (Neem)Oil, Jasminum sambac(Jasmine)Oil, Mentha Piperita (Peppermint)Oil, Melaleuca Alterniflora (Tea Tree)Oil. 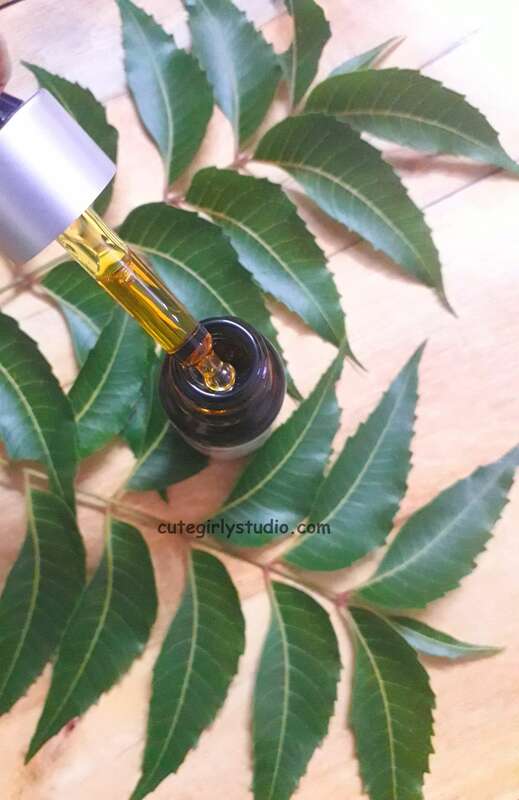 The frankincense and hemp seed serum comes in a tiny amber color glass dropper bottle. The bottle is sturdy and travel-friendly. I just like the tiny bottle. I haven’t tried any product from juicy chemistry and one day I thought to give it a try and ordered some hair care products along with this serum. Despite living in the same city where juicy chemistry’s flagship store is located, I have never visited their store (blame my laziness). I ordered the products online and it reached me in 4 days. I didn’t expect anything from this serum and I bought this just want to introduce oils to my skin. To my surprise, this has become my current favorite product. I started using this from the day I received this. I use this only in my night time skincare routine. The serum has strong jasmine smell along with the notes of spices. Personally, I don’t like the way it smells, it’s heavy and lingers for about 5 minutes. The serum has yellowish to orange colour and it leaves a yellowish tinge on our face which most of us won’t like. This is the reason why I use this serum only at night time. Juicy chemistry frankincense and hemp seed serum have oils that have a comedogenic rating of 0. Almost all the oils have the comedogenic rating of Zero. Only neem and rosehip oil don’t have the rating of 0. I was impressed with the ingredient list. Though comedogenic rating is not a universal scale to judge, personally I prefer oils with a low comedogenic rating. 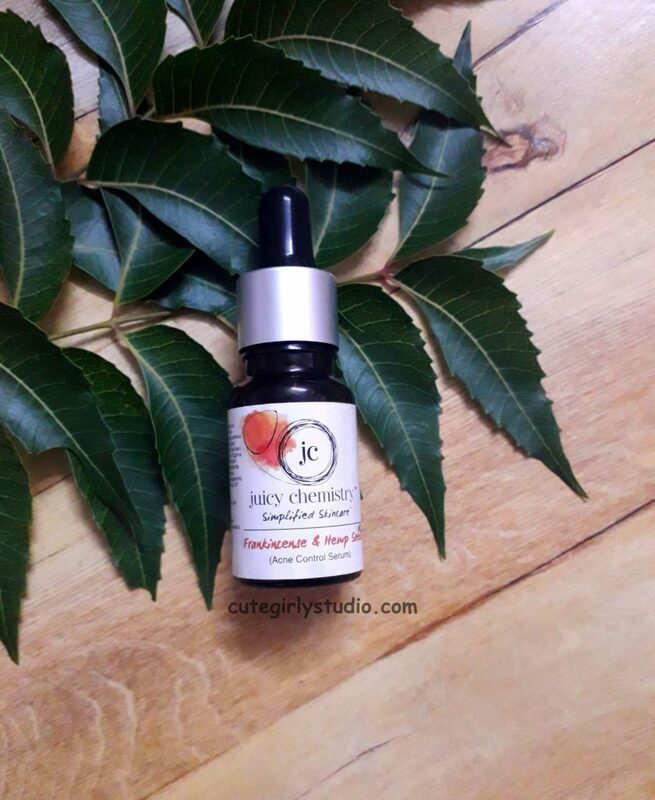 When I started using Juicy chemistry’s acne control serum, I had big inflamed acne all over my right cheek. I took 3 drops of this serum and warmed between my palms and I pat it all over my face. 3 drops are enough for my face. Many reviews stats that this serum is heavy and it takes time to get absorbed, but I don’t feel this to be heavy. In my opinion, this is lightweight facial oil. After using this acne control serum for 2 days I was pleasantly surprised with the result. I must be lying if I say it dried my acne overnight, within 2 days my acne reduced in size and part of the acne had dried. Then I was consistent with this serum and within 10 days, my skin cleared up. This is really a miracle product for me. Whenever I feel that my skin is about to break out, I take 1 drop of this serum and dab it on the area where my skin is about to break out and Trust me, girls, it prevents my skin from breaking out. I also use this as a spot treatment on my big painful pimple and this serum helps to shrink it quickly. I didn’t find any improvement in the acne scars but this stuff is effective on active acne. After using this for a month, this is my go-to treatment for acne. I have read many reviews stating that this has made their acne worse and so and so. But my skin didn’t react negatively to this product. I think when used in correct quantity this serum suits oily skin. I have acne due to inflammation, I can’t comment on its efficiency on cystic or hormonal acne since I don’t have those type of acne. Initially, this might look expensive, but since we are going to use only 2 to 3 drops per day this is worth the price. I bought the 10ml bottle and even after using this for more than 6 weeks I’m left with 60 % of the serum. This tiny bottle would easily last me 3 months. Overall I love this serum. If you want to give this serum a try, I would defiantly recommend a patch test since this acne control serum has mixed reviews in the blogosphere. Heals acne faster without drying out the skin. Prevents acne in my case. Not a fan of its smell. Leaves yellow tinge on our skin. 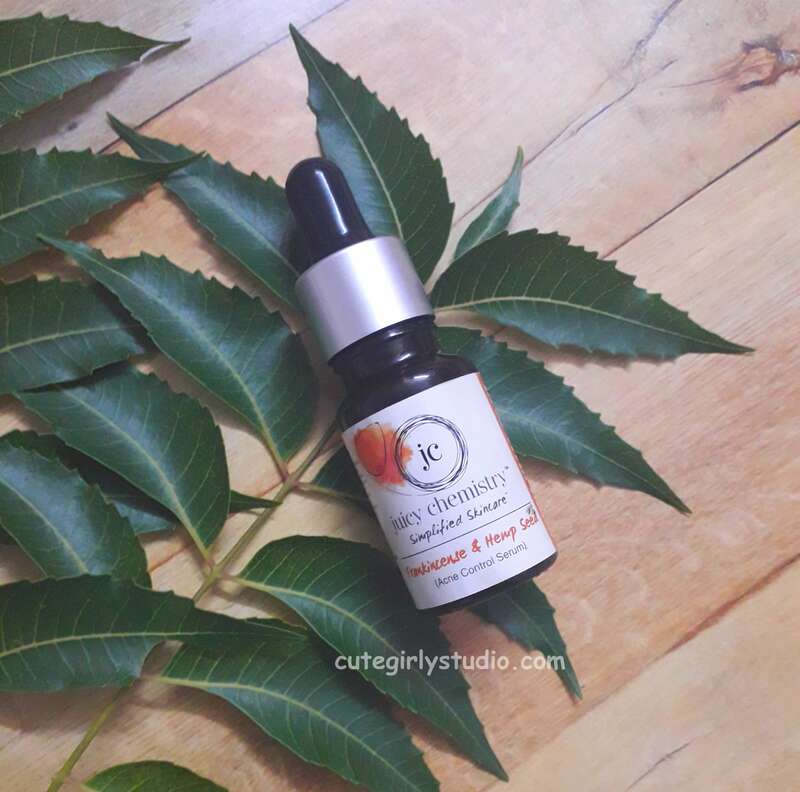 Overall I love this frankincense and hemp seed serum by juicy chemistry. It does what it claims and it exceeded my expectation. This has become my go-to treatment for my acne. I’m giving 5/5 rating despite 2 cons since those cons are negligible before the efficiency of the product. 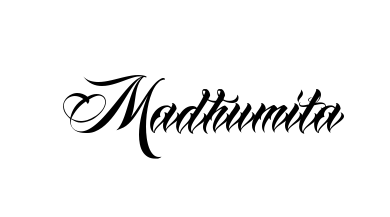 I would be really happy if you consider subscribing to my blog. If you have already used this serum then comment your views about this serum. Don’t forget to follow me on Instagram | Facebook | Pinterest, and Google+.